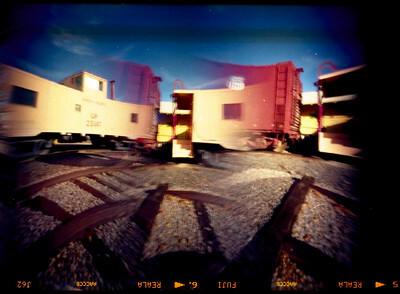 The Pinhole Blender series of cameras are an inexpensive yet very effective way make pinhole images. 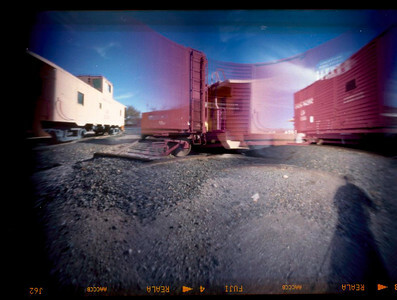 This model is a medium format camera with three pinholes covering 180 degrees. You can advance the film and turn the camera and take another exposure to make it a full 360 degree view. But the individual images will be flipped and the final result will be a "creative" version of the actual scene. Individual pinholes may be used in any combination. Refrigerator magnets are used for the shutters. The camera is made from a large cookie tin. I find the camera somewhat flimsy and difficult to use. I currently prefer the mini version of this camera I need to experiment more with this camera.